September 27, 2012 By: Rico Renzi Category: DISCUSS, EVENTS, Heroes Pop Swap, Sale! We had so much fun with this event last time that we had to do it again! The Pop Swap is a great place to find a loving new home for your old collectibles that are taking up too much of your space. It’s also a great place to find great items for yourself or a unique gift for a friend! Since Pop Swap takes place right before Halloween, this is also a prime opportunity to test out your costume! Click the image to apply for space to sell your items and we’ll see you on Saturday, October 27th! Heroes Pop Swap is an idea that I had on the way back from a recent road trip. Before Heroes Convention and the Charlotte Mini-Con and even the Heroes store, local comics fans would gather and trade comics and talk about our hobby. It was usually something like a sidewalk sale put together by a local bookstore and/or newsstand. I remember going to similar events in Winston-Salem, Greensboro, Raleigh and the famous Murray Brothers’ backyard and basement gatherings in Durham during the latter half of the 70’s. None of us “old-timers” were official dealers yet. None of us had stores. We just shared a common interest in collecting as well as buying and selling comic books and related stuff. 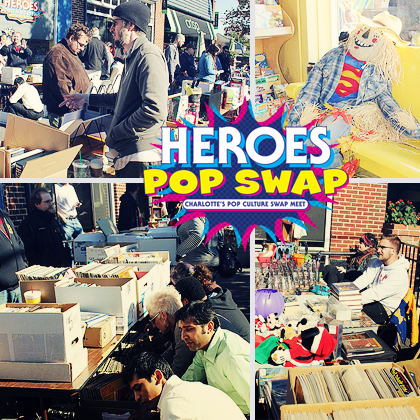 We thought we’d try to bring back that feeling from those events with the Heroes Pop Swap: Charlotte’s Pop Culture Swap Meet. For a nominal fee anyone can reserve space and sell items from their personal collection to other fans who are sure to give that item a good home. We are also encouraging local artists and artisans to come and sell their art, pop-culture related crafts and comics. There will be no professional dealers. Professional will be defined by me personally. If you buy and sell comics regularly either at conventions or online you will be excluded from setting up, but I encourage you to come shop! I anticipate a lot cool items being offered. We want to limit this event to local creators and comics and pop culture enthusiasts who have interesting items from their personal collections that they are willing to sell and self-produced comics and related products. People who are purchasing space are encouraged not only to bring comics but any items falling under the pop culture umbrella. That could be toys, games, music, movies and more. Reservations are 1st come, 1st served. Click here for the application. You can reserve 4 ft ($10)-6 ft ($15)-8 ft ($20) space. We can provide a limited number of tables, if you have your own table you are encouraged to bring it. You will still be charged for the space. We will provide chairs if needed while supply lasts and you are welcome to bring your own as well. Set-up starts at 9am, please plan to stay set up until at least 4 PM but you are welcome to stay later if things are going well for you! Since this event is so close to Halloween don’t be afraid to come in costume. Trick or treating will be part of our advertising for this event, please consider bringing a treat of some sort for the kids (candy, button, stickers, comics etc..). We think this will be a fun event for everyone involved and if it is successful we’d like to make it something we do few times a year.